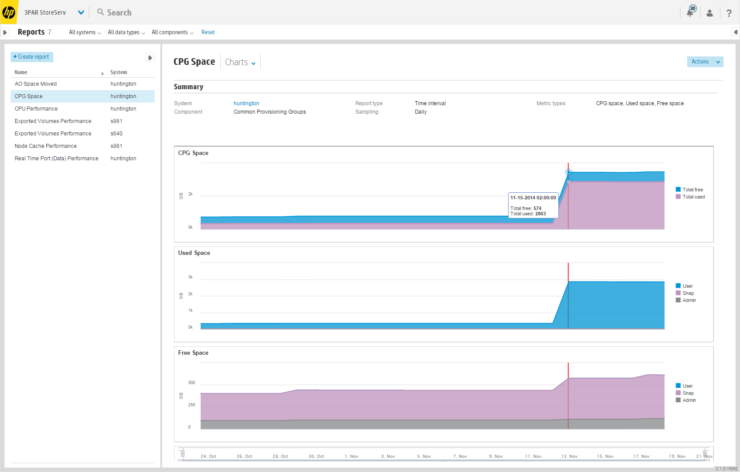 Last week at HP Discover HP announced the successor to the current 3Par Management Console as the StoreServ Management Console (SSMC). 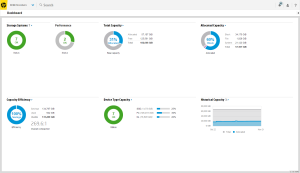 The SSMC is a from the ground up redesign, and as the admin console is somewhere sysadmins will be spending a good amount of their time I wanted to take a look at it today with some screenshots. The SSMC is accessed via a web browser, the above screen show the new login screen, straight away you see this is a much more modern and fresh look compared to the 3Par Management Console. Once logged in you will arrive at the dashboard screen. The purpose of this screen is to give you a high level view of the status and health of your complete environment. 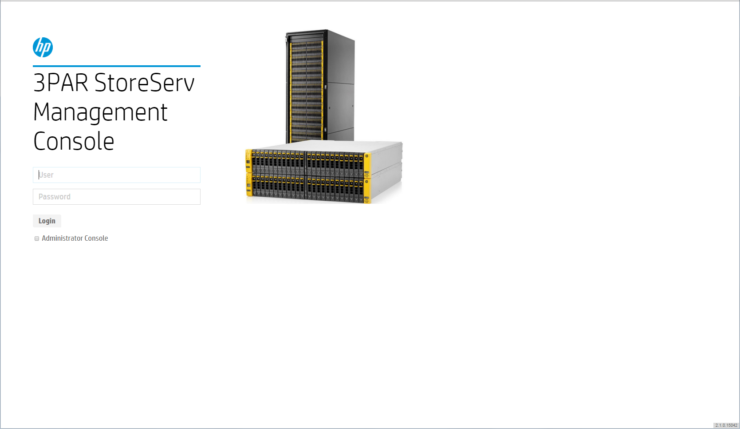 Up to 16 3Par StoreServ systems can be connected to a single instance of SSMC. The look of the console is to be kept common across HP systems including One View for consistency. 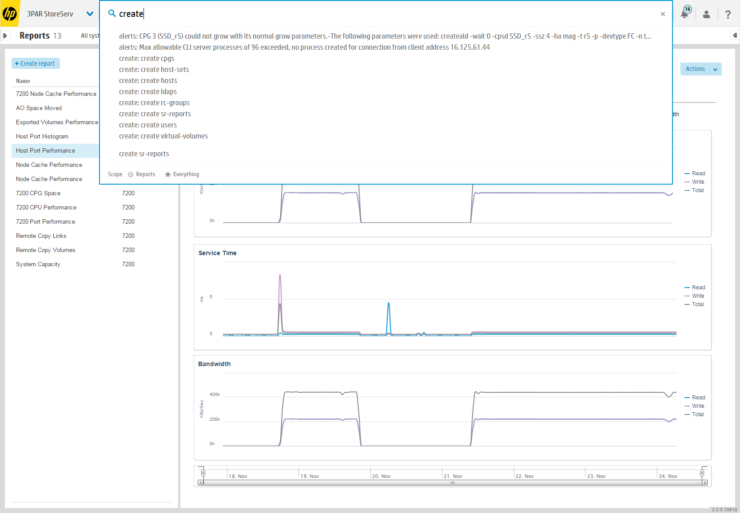 I went to look at the MoonShot system at HP Discover and noticed this was also using the same style of interface. Working from the top left of the dashboard you first see the number of 3Par systems connected to your SSMC and their status. Next to the right you see the performance status of the connected systems and then all the other donuts are related to capacity. 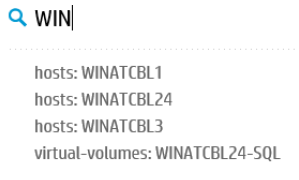 To create thresholds for alerts relating to performance the new CLI command createsralertcrit must be used. You can click on any item to drill down further, so for example if you clicked on the storage systems area like shown below you would be taken to the systems view where you can see each system individually. 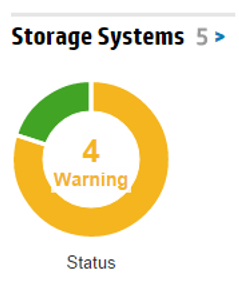 Clicking on a particular segment will just take you to those systems with that status, so for example if you clicked on the green portion of the donut in the below screenshot you would be taken to those systems with a healthy status. To give you a feel for what’s on the Mega Menu see the close up screenshot below. You will notice the file persona menu will appear when it’s licenced. Although not all the feature’s of management are in the SSMC, in the longer term the SSMC will be a single stop shop for the management of all features for block, file and object storage. 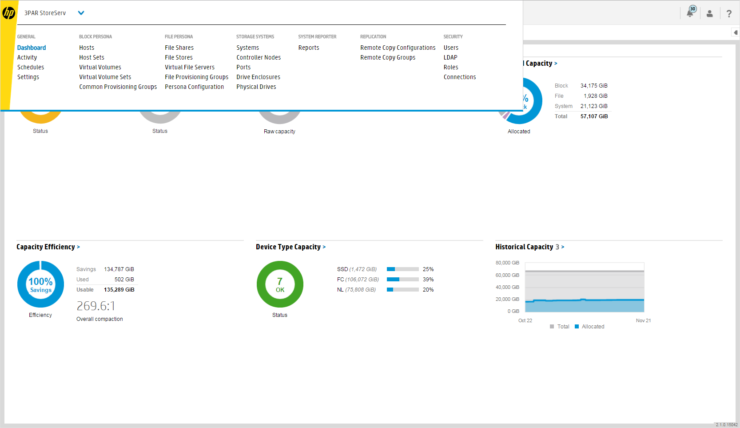 In the short term the 3Par management console will need to be used for functionality such as configuring AO which has not yet been migrated to the SSMC. Another way to navigate around the system is by using the new global search function. For example the screenshot below shows that by typing create into the search box you are presented with all the available create options such as create host, create CPG etc. 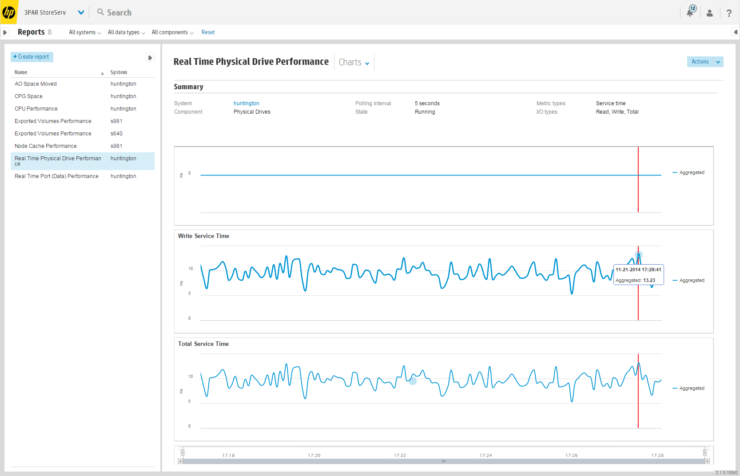 To help to see how items correlate together there is now a map view, the idea is very similar to the map view found in VSphere. The below screen shot shows a map of how the physical components of a system fit together. Maps can also be used to map the relationship between logical components such as CPG to VV association. If you do not have a System Reporter licence only real time data can be displayed. Below shows one of the available performance reports, you can zoom into a chart to change the sample time for example from daily to hourly. The SSMC will be available from mid December and will be available for download from the Software Depot. Access can be from a Firefox, Chrome or Internet Explorer browser, mobile devices that support Chrome are supported. The SSMC can be used to manage the seven and ten thousand series. The 3Par will need to be on 3Par OS 3.1.3 or later. UPDATE – Since this post was published SSMC 2.1 has been launched, check out this post which details all the new features. If you want to learn more about SSMC take a look at my beginners guide to SSMC series. To stay in touch with more 3PAR news and tips connect with me on LinkedIn and Twitter.